— Franklin Cascaes (1908-1983), Artist e Historian from Florianopolis. In a mystical Island in South Brazil multiple girls disappear. The only connection? Folk tales. If you picture the island of Florianopolis as this summer paradise with perfect bodies tanning in the hard sun, that's not what you will find in Desterro. The series focuses on the forgotten side of the island, it takes place in the neighborhoods that few know about. It has its roots in the folklore of the natives, not the metropolitans who took over the island. And it is set during the cloudy, harsh winter days, when the southern wind almost breaks your skin. Gritty, dark and mystical. This is the atmosphere that surrounds the characters of Desterro, repressed people who have their roots in the Island - fishermen, lacemakers, healers. How does their world collapse when horrific murders inspired by folk-tales happen right in their placid community? Stepping with us in this journey are two detectives. Laura Macedo is an urban, tough and decisive woman, who recently moved to the island. 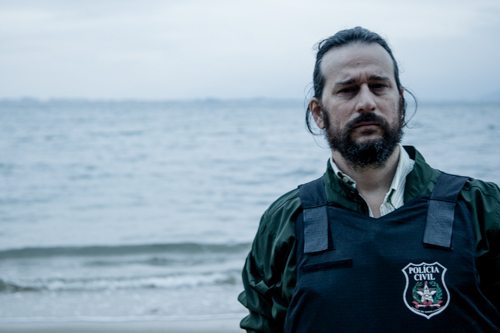 Roberto Santos is funny and warm, the son of a fisherman who inspires to be a politician. These detectives have two different attitudes and will have to work together when they face a series of murders. Laura wants to find a killer, no matter how unsolvable these cases might seem while Roberto doesn't even believe that there is a real killer. When the murders are revealed to be perfect depictions of the eerie drawings of the late folk-historian Franklin Cascaes, one might think that they really are the work of supernatural creatures. While the cases of missing girls continue to show up on their desks, the detectives drift further apart, and the media's sensationalism interferes with their work, making a community that was once so tight collapse. © LAMARACA LLC & MARACA INC. — ALL RIGHTS RESERVED.